rec. 21-23 June 2007, Kirche der Barmherzigen Brüder, Schärding am Inn, Austria. I greatly enjoyed Michi Gaigg’s directorship of Telemann’s Miriways (see review), so was keen to hear what she and L’Orfeo Barockorchester would make of this repertoire. It turns out that this is not a new recording or release however, and you may have come across it as a SACD from the Phoenix label. This standard CPO CD therefore represents something of a demotion if Super-Audio is important to you. The first movement of Les Élémens opens with a genuinely unique musical ‘wow!’ moment, and something which in this performance is actually quite scary. Le Cahos or ‘chaos’ leaps out of your speakers with a disorientating cluster of notes: all of the tones from the initial key played simultaneously and with a raw attack which can make you jump out of your skin. This energy is preserved in the louder sections of the movement, but the strings stifle the scales played by the flutes as a representation of ‘air’ almost entirely. This and the strained high trills at 4:52 just prevent this from being a first choice for some of the most remarkable music of this era, but it’s still pretty impressive. One of the best alternatives for this work is on the Archiv label with Musica Antiqua Köln, where the flutes come through clear as a bell in Le Cahos. Christopher Hogwood and The Academy of Ancient Music is also good on Decca L’oiseau-lyre, but his Cahos is a bit too slow and safe for my taste. The rest of Les Élémens is more conventional but still very much worthwhile, the suite presenting crowd-pleasing musical descriptions of ‘the blissful state of nature before mankind appeared’. 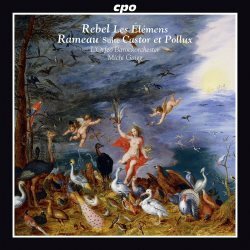 Rebel would have been in his 70s when this work was given its first performance, and 1737 is also the year the suite from Castor et Pollux by Jean-Philippe Rameau was first given in the Académie Royal de Musique. The record catalogues aren’t over-stocked with versions of this work, but if you can find the old Philips recording from Frans Brüggen and the Orchestra of the 18th Century then that would be my first choice. Michi Gaigg’s version has a more chamber music feel which has its own qualities, but the richer textures of a bigger sounding orchestra serve the music that much better, the more tender emotions felt deeper and the more lively movements less clipped. This is not to say Gaigg’s Castor et Pollux serves us poorly. On the contrary, there is plenty of dolorous sentiment in something like the Sarbande – Air pour Hébé et ses Suivantes, and fun in the castanets of the Passepied, just to point out a couple of fragments. Almost worth it for the shock of those opening moments alone, this is a very fine recording of some excellent baroque repertoire. If you are only looking for the best of one or other of these works then it pays to shop around, but if the coupling attracts then you won’t be disappointed.